Tuesday 12/15: Paine at lunch. Lots and lots of common stuff. Most interesting bird was a junco with a hint of white wingbars. Wednesday 12/16: Lyman Pond, nothing of note. About 110 geese at Fernald. Thursday 12/17: Too cold to go out even though I had taken the day off for CBC scouting. Fun time at the museum a least. Friday 12/18: Eagles! Beaver Brook North after, 1 grackle, 2 Great Blue Herons, many Tree Sparrows. Saturday 12/19: Down the rest of the Charles, not a whole lot. Also a stop at Gore Place where the Chipping Sparrow continued and a walk around Lot 1 with lots of robins and a few red-wings. Sunday 12/20: CBC postponed because of snowstorm. Tree Sparrow in the yard among other things. Monday 12/21: Annual holiday lunch, so no birding. Tuesday 12/8: Charles at lunch: 2 hoodies, very little else. Wednesday 12/9: Too nasty out for anything. Thursday 12/10: Lyman Pond: Double-crested Cormorant still around, Great Blue was about it otherwise. Big flock of geese on Warren Field but nothing interesting among them in a quick scan. Friday 12/11: Paine, lot of the common stuff but nothing of real interest. 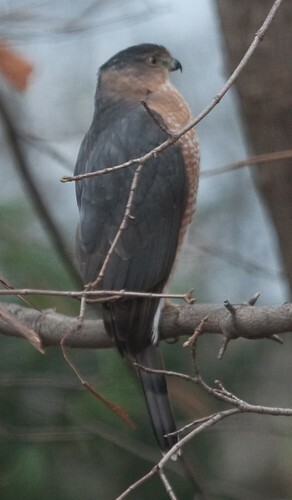 Saturday 12/12: Stayed in, 18 species in or around the yard. Monday 12/14: Green-winged Teal at the YMCA. 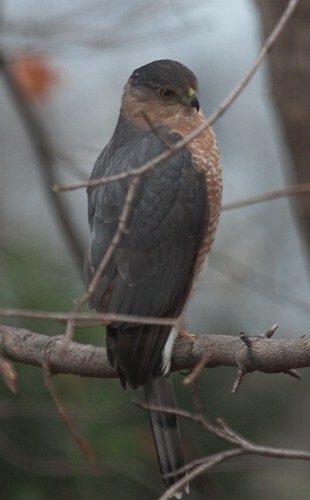 Lot 1 had lots of birds including a grackle at the pond and some waxwings mixed in with the many, many robins. Golden-crowned Kinglet in the yard, Wednesday 12/2. A single meadowhawk still flying, Friday 12/4. Wigeon, Green-winged Teal, many mergansers (both Common and Hooded), and a kingfisher on Hardy Pond, Saturday 12/5 (and everything but the kingfisher Sunday too). Red-breasted Nuthatch at Paine, Monday 12/7. Tuesday 11/24: Lyman Pond at lunch: 1 heron, 2 hoodies, 2 cormorants, 100+ regular geese. Wednesday 11/25: Had to run to the mechanic before work, so made a couple stops along the Charles. About 9 Wood Ducks along Charles River Rd and Edgewater Dr along with a Pied-billed Grebe and 3 coots. 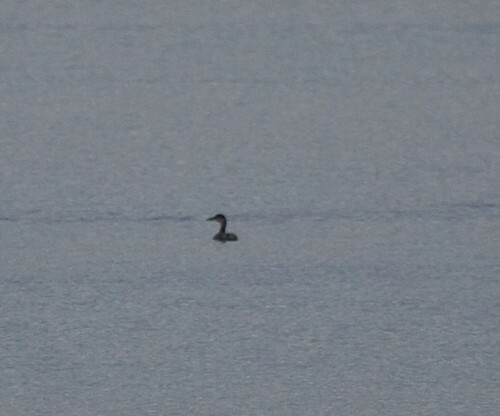 One grebe at Forest Grove (just on the Waltham side of the line). Stopped at Hardy Pond at noon, about 10 hoodies, one ruddy, and a ton of juncos. Thursday 11/26: Out to New Salem for Thanksgiving. Odd goose at the rotary caused a detour but it appeared to be a domestic. One moth in the house was about the only thing of note, appears to be Grote’s Pinion. Friday 11/27: Rain canceled plans to head to Otis, nothing interesting on the ride home from New Salem. Big flock of robins over the yard and starlings over Leitha late in the afternoon. Red-wing and Red-belly calling from the end of the street. Sunday 11/29: Another MacGillivray’s and a big milestone. Also 2 meadowhawks still around. Monday 11/30: Lunch at Hardy Pond: 2 Common Mergansers, many Hooded, 1 Ruddy. Tuesday 11/17: Beaver Brook North before work. Raven (is that notable still? ), few red-wings, not a whole lot else. Paine at lunch, nothing of note. Wednesday 11/18: Purgatory Cove at lunch looking for Green-winged Teal and Screech-Owl. Neither of those and not much else. Pied-billed Grebe on the river, heron in the cove. Ring-necked Duck popped up as I was driving off. Thurday 11/19: Field Station at lunch. One Song Sparrow and one Tree Sparrow in the gardens so I went to Fernald to look at geese without finding anything unusual. Friday 11/20: It was supposed to be rainy but it looked nice so I went to Prospect Hill instead of Hardy Pond and found very little. Two meadowhawks still. They’ve already survived a night in the 20’s and with nothing close to that in the forecast I wonder if one may make it to December. Sunday 11/22: Long walk around Met State. Heard-only Winter Wren was about it other than good numbers of common stuff. Several meadowhawks still. Great Meadows later, very little there but a huge flock of grackles on the way. Monday 11/23: Heron overhead on the way to work. Paine at lunch, checking the pines for owls so not much of anything. Wednesday 11/11: Day off, so Minuteman Trail (falcon sp, few tree sparrows), Great Meadows (2 Pied-billed Grebe, big flock of red-wings, etc), Cambridge Res (goldeneye). Thursday 11/12: Charles, next to nothing. Friday 11/13: Beaver Brook ponds again, no goose but a few hoodies and a kingfisher. Lots of geese at Fernald but didn’t give them a thorough check. Saturday 11/14: Poured all day, nothing much at the feeders. Sunday 11/15: Arlington Res with Menotomy: 6 shovelers and basically the same as last week. One meadowhawk may or may not have still been alive. Quick check of Beaver Brook (barely anything) and Fernald (only a handful of geese) and a swing around the Res (kingfisher, Wood Ducks, goldeneye). Monday 11/16: Prospect Hill: Red-breasted Nuthatch (finally for the county this year), several Hairy Woodpeckers. Tuesday 11/3: Started for Prospect Hill at lunch but thought there was voting and the gate was closed, so ended up circling the Cambridge Res. Of course, finally had taken the scope out of the car, so the 3 interesting blobs way out had to stay unidentified. Stopped at Hardy Pond to eat, nothing much there. Wednesday 11/4: Went to Paine at lunch, only to discover there was a major fallout of scoters and stuff all over. Hermit Thrush, Cooper’s, many meadowhawks and a couple Shadow Darners were the best I managed. Thursday 11/5: Tried Cambridge Res before work. While dodging traffic, a Pied-billed Grebe, 2 Bufflehead, and a big flock of sleeping scaup. Cormorant at Hardy Pond. Lunch at the duck ponds with nothing of note. Friday 11/6: Lot 1, quiet beyond a few Hoodies. Sunday 11/8: Fresh Pond after the Menotomy trip to Dunback: 12 Canvasback, 75 Ring-necks, 1 Bufflehead, 50+ Fish Crow. Monday 11/9: Prospect Hill: Shadow Darner, sulphur, Autumn Meadowhawk, nothing much for birds. Friday 10/30: Purgatory Cove: about 50 Ring-necked Ducks, 10 Wood Ducks, first Red-bellied Woodpecker along the Charles, Sharpie. Hardy Pond in the late afternoon: 4 Ruddy, 1 Pied-billed Grebe, 4 American Wigeon. Saturday 10/31: Out to New Salem for the day where it was dark and nasty. Two creepers were about it for highlights. Sunday 11/1: Started at the Cambridge Res. Red-necked Grebe! That’s 181 for Waltham. Also the first Common Mergansers of the fall. On to Flint’s Pond where there wasn’t much beyond a bluebird. Continued to Meriam’s Corner where there wasn’t much and then on to the Waltham St. Fields where there were 2 White-crowned Sparrows and more bluebirds. After a stop at home, went to look for Cackling Geese with the parents. No geese along Rt. 2, so we stopped at the prison fields quickly. Luckily a Cackler was in the first flock, so we didn’t have to stay long. On to Great Meadows, with a late Spotted Sandpiper and a few Blue-winged Teal. Monday 11/2: Not much. Field station at lunch with nothing of note. Too dark by the time I get home now to do anything, but at least it’s light again in the morning for a few weeks. Tuesday 10/20: Prospect Hill at lunch: Raven, Mourning Cloak, Autumn Meadowhawk. Wednesday 10/21: Met State: Blue-headed Vireo, another cloak and meadowhawk, not a whole lot else. Thursday 10/22: Owl. Turns out to be #100 at Prospect Hill as well. Friday 10/23: Hardy Pond on the way to work: 3 Ruddy, 1 Pied-billed Grebe, 1 Grackle. Lot 1 at lunch: Swamp Sparrows, first of fall Hooded Mergansers. Saturday 10/24: Cambridge Res: Black Scoter, 2 Hooded Merganser. Flint’s Pond: 2 Hooded Merganser. Merriam’s Corner: Pipit, huge flock of Savannah Sparrows, 7 Bluebirds. Nine Acre Corner: huge flock of blackbirds. Sunday 10/25: Rock Meadow/McLean: not much of anything. Great Meadows was totally dead other than a surprising number of meadowhawks still around, along with one presumed Shadow Darner (a presumed one in the yard as well). Monday 10/26: UMass Field Station before work to check on a possible Clay-colored. No luck, but the sun was just coming out above the trees when I had to leave so there wasn’t much activity. Lots of blackbirds overhead and 2 herons went by squawking at each other. Tuesday 10/13: Purgatory Cove at lunch. Luckily the rain let up as I finished eating and I was able to get out and scan. Highlights were 40 Wood Ducks and my first Pied-billed Grebe for the Charles. Yellow-rump show around home slowed down but robins were going over nonstop around 5:00 PM. Wednesday 10/14: Scoters! While not finding any at the Cambridge Res at lunch, Hardy Pond had a Ring-necked Duck. Thursday 10/15: UMass field station before work, nothing of note. Beaver Brook ponds at lunch, decent numbers but nothing exciting. Friday 10/16: Snow. Surprisingly not bad at lunch, so went to Paine. Swamp and Savannah Sparrows among other things (Savannah apparently new for the site). Saturday 10/17: Led a Menotomy walk to Waltham St. Fields. Vesper and White-crowned Sparrows seen briefly, lots of Savannah and other common stuff. Raven flew over Dunback on return to cars. Drove around a bit afterwards: 4 Ruddies on Cambridge Res, 100+ crows at School St, Acton, and many geese in Concord but nothing jumped out as interesting. Sunday 10/18: Raining and snowing, didn’t go out and nothing in the yard. Monday 10/19: Lyman Pond at lunch: 22 Wood Ducks, 1 Autumn Meadowhawk. Kestrel and late Pewee at the end of the street on a late afternoon walk.